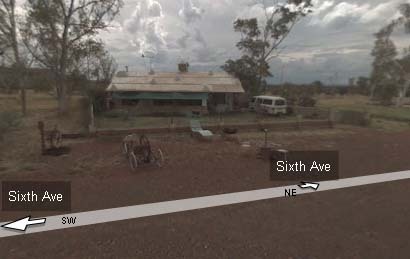 Has anyone else been wasting their life looking at Google’s street view photographs of Australia? I only found out about it by accident last weekend (I’ve been waiting for London to come online, not realising they’ve been working on Australia all this time) and have spent hours since then poring over the maps. It seems to be a universal quirk that everyone first goes to look at somewhere they already know quite well, to compare the images with the reality of their memories. I looked up the suburb of Adelaide I grew up in, to find that Google captured the area in the midst of that great Australian tradition, Hard Rubbish Day. My grandma’s old house, in a tiny town off the highway in an obscure backwater of New South Wales, is now visible to the world online. On the other hand, my girlfriend looked up her mother’s house in Caulfield only to find her section of street replaced by a black screen and the ominous legend “This image is not available.” She called home that night. I don’t think it was the block on which that unfortunate man conked out after a night on the turps, after attending his best friend’s funeral (as the whole world now knows). That image, now removed, seems to be the only Australian one so far to have joined the likes of the fence climber and the burning house amongst the American street views. Incidentally, the block on which that house burned down has also been blacked out, even though the hoses and smoke can still be clearly seen from further down the street; and of course, the images Google removed can still be seen on dozens of web sites around the world. The images persist after reality, even Google’s version of it, has moved on. 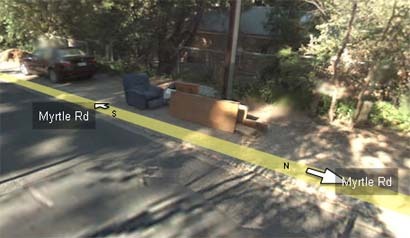 Google would like to show the world in Street View, but remain invisible itself. The camera car is never seen, but on the dirt roads in remote parts of Australia, it reveals its presence as a cloud of dust stretching out along the road. (By this stage, the name “Street View” is becoming less and less appropriate.) The presence of the camera and the people who control it is also reflected in the choices the drivers have made. I’d like to know what made the Google people decide to make a detour through Wittenoom. Were they following instructions or defying them? Acting out of ignorance or out of curiosity? Perhaps it was a desire to witness and preserve, in some way, what was left of the town before it was completely erased from the face of the earth, regardless of the potential risk to their health. I hope they drove around with the vents and windows shut. What is there to see in Wittenoom? Empty blocks and crumbling streets, a few scattered houses, some still occupied. A mysterious truck with “Sound Production” painted on the sides is parked outside one home. The townsfolk apparently still offer accomodation for backpackers, at six bucks a night. One of the residents still holding out against the government’s plans to relocate her has set up a website, but it hasn’t been updated for several months. Not surprising I suppose, being without access to the internet, phones, or mains power.